The school campus is housed in the former convent of San Francesco, the monumental 13th century complex which has recently undergone a massive restoration and functional adaptation project, sponsored by the Fondazione Cassa di Risparmio di Lucca. 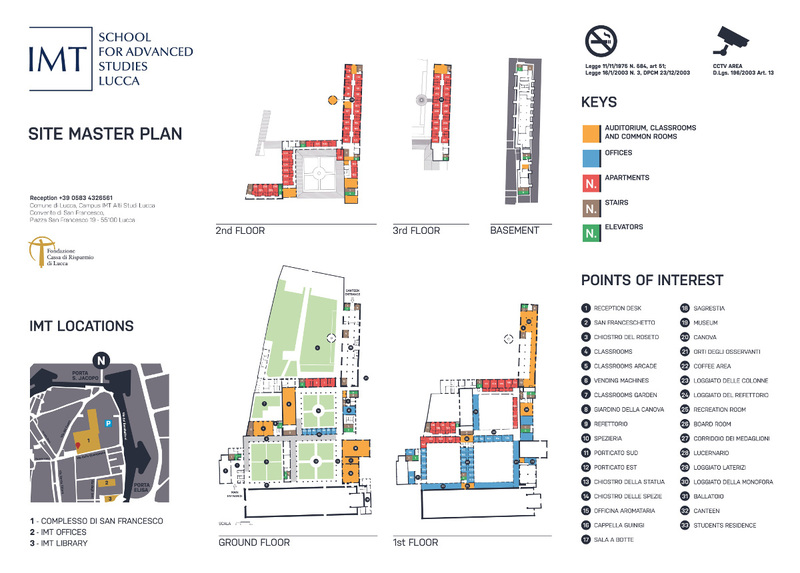 The San Francisco complex can provide housing for over 100 students, including rooms and apartments, as well as housing modern research laboratories, equipped with the most sophisticated technologies. The so-called “Ca’ Nova”, once used for grain storage, was transformed into a canteen and meeting space. Study rooms were created in the former library, the Church of San Franceschetto and the old Sacristy. The Guinigi chapel was set up as a lecture hall, equipped with the most modern equipment. While preserving the original artworks that still exist today, the Church of San Francesco, a wonderful example of Franciscan architecture, is now used for hosting large size events. The complex houses various internal and external areas used for study and socializing. Without a doubt, the residential campus offers students and researchers of the IMT School the chance to live an experience of full interaction and multidisciplinary integration.